There are many different ways to manually brew a tasty cup of coffee in your own home. 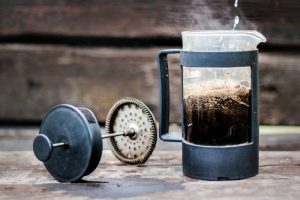 However, if you are looking to be more hands on and in control of how your cup of coffee is going to taste, then try one of these 5 common manual brew methods. Be ready to toss out that regular household automatic coffee maker or stick it back in the kitchen cabinet for a busy or lazy day. 1. 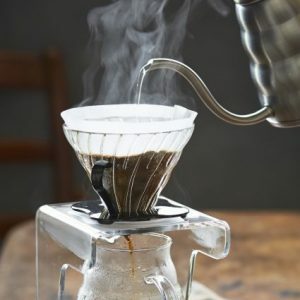 POUR OVER method, also known as hand drip coffee, is very simple, but allows your to have complete control of the taste, strength, and water temperature. You just grind fresh coffee and then use a brewing system to pour hot water over the grounds. Basically this consists of ground coffee, filter, filter holder, and a cup of serving vessel. There are no electronic parts to plug anything into and no complicated parts to put together or break. Cleaning is low maintenance and anyone can do it! The two common brewing systems are the Hario V60 and Chemex. They are different in appearance, but similar in the brewing method. They both give you great control over the brew. If you want elegance and the ability to choose many different sizes, go with the Chemex. 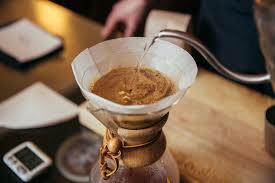 The Chemex can also make many cups of coffee for more people with just one brew. The Hario V60 is really just a cup or two for just one person, but is easier to clean up and gives you a quicker brew. It is also more portable with the plastic option. 2. 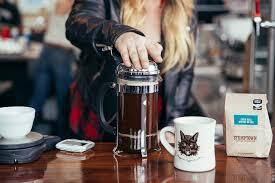 FRENCH PRESS, sometimes called a coffee plunger in some parts of the world, is a full immersion brewing device. Simply, it steeps the coffee grounds in hot water and then the grounds are pressed out for a delicious bold cup of coffee. It is affordable and does not require any paper filters as it uses a metal mesh filter. You can control the brew time letting the grounds sit a little longer in the hot water giving you a stronger cup, but not too long as it can become bitter. It is recommended that grounds be on the coarse side, unless you like your coffee a little muddy. The French Press is simple, saves you counter space, and you can take it anywhere with you. Nothing to plug it into and best of all, you can use it for cold brew or tea. 3. 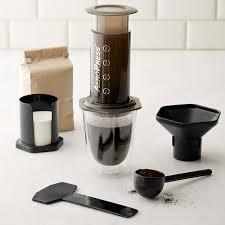 AEROPRESS is a plunger and chamber coffee maker that is perfect for the on the go busy coffee enthusiast. 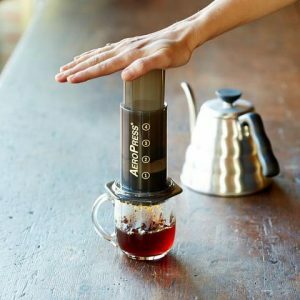 There are two ways to brew with the Aeropress. There is the tradition method and there is the inverted way to brew. The traditional way the water drips through the filter paper immediately when poured over the grounds. With the inverted method, the water stays with the ground until the Aeropress is flipped over. Try out both ways to see how you prefer your coffee! Even though either method only makes a single cup, it can make a more concentrated espresso like coffee. The brew time is super quick with just a minute or two and very easy to clean up. 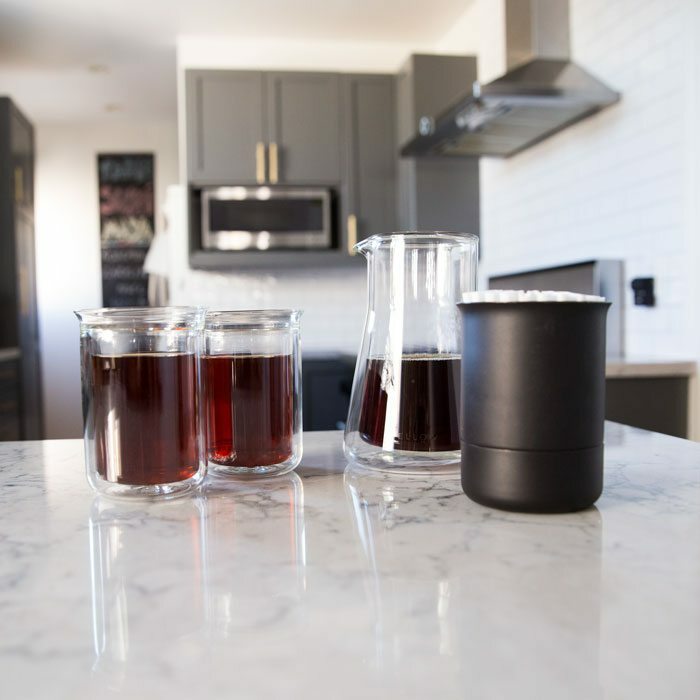 The Aeropress is super portable as it small with only a few parts and can be packed for travel. 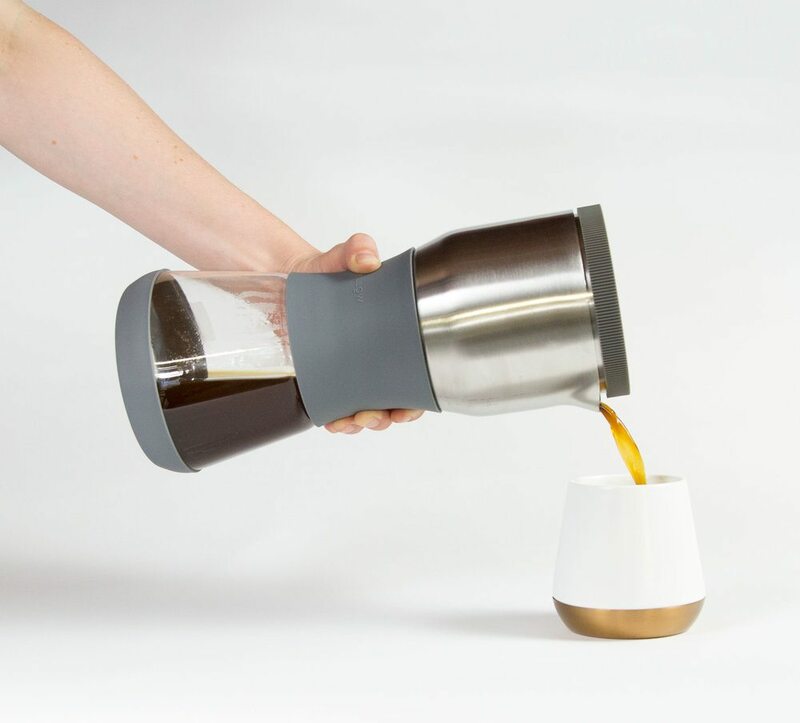 It does require specific filters and a quick assembly each time you want to drink coffee. Other than that, if you are on the go, this is perfect. 4. 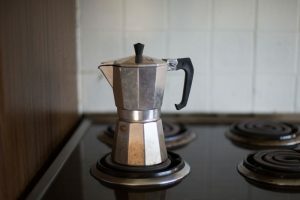 MOKA POT, also known as the stove top coffee maker, is the brewing device people prefer and go to for a more espresso like cup of coffee. No electricity is needed for the Moka Pot, but it does require a stove top. How does the magic happen with this type of brew method? Well, the pot is divided into three chambers: one for water, one for grounds, and one for the final product. While on the stove, the water at the bottom of the pot will boil. As the steam pressure pushes the water upward through the coffee ground , the extracted coffee will be sent through the top of the pot. This process is going to take a little getting used to, but worth it for the intensity and strength of the coffee produced. This can portable for the outdoors as long as there is a portable stove top or flame such as a campfire. 5. 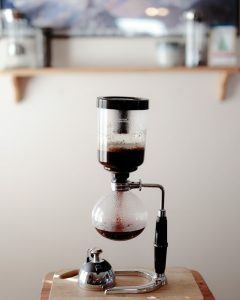 SIPHON coffee maker, sometimes called a vacuum pot, may be the most visually interesting of all the brewing methods while producing great tasting coffee. The Siphon has two chambers where the bottom is first filled with water. The bottom chamber is then heated where vapor pressure will force the water to rise into the upper chamber. Coffee grounds is now poured into the top chamber to mix. Next, the heat is turned off and the loss of vapor pressure will cause the water to drop back into the bottom chamber due to gravity and a vacuum effect. With the Siphon you get a full immersion brew for full flavor results. While it is stunning to look at, the Siphon is complex with delicate parts. It is hard to clean, not portable, and brewing time is a little longer than some of the other methods. There are many different kinds of Siphons out there. However, if you want a home version that is a little easier to use, KitchenAid has one available. Make sure your French Press is clean. Old Grounds left in the strainer can import bitterness into your fresh batch of super delicious coffee! Starting with Fresh Roasted whole bean Dangerous Coffee will make sure you can capture all of the rich smooth dark roast flavor possible. Keep your whole beans sealed in an air tight container if possible. When you grind your beans all of that terrific smell is your flavor escaping so you want to get water on those grinds a soon as possible.Make sure your water is optimal temp before you grind. That way you can get water on those grinds immediatly! Measure and grind your Dangerous Coffee Beans they should end course like bread crumbs. Finish filling the French Press all the way up and place the top on it without pressing the plunger down. Allow the coffee to Brew for till the timer hits about 4 minutes 30 seconds. Now it’s time to press your coffee! Slowly and firmly begin to press the plunger down. You are actually trying not to disturb the grinds any further so slow and steady is the method. Time to serve and enjoy your bold and smooth Dangerous Coffee! Pour all of the coffee you plan to drink so you avoid over extraction which will make your coffee bitter and acidic. Make sure your Fellow Products Duo is clean. Old Grounds left in the strainer can import bitterness into your fresh batch of super delicious coffee! Listed from right to left – Duo’s lid – Stainless steel top – Stainless steel brew chamber – etched cone filter – silicine band – borosilicate glass carafe and a protective glass booty. First you have to assemble this coffee steeping beast. Place etched cone filter into the chamber. The filters gasket should fit flush and snug in the bottom of the brew chamber. Now place the brew chamber into Duo. If you look on the side of your brew chamber you will see 3 icons. The middle arrow icon is what you are going to use for proper alignment. Line up the arrows to the tops spout and slide the chamber down. The last step is to attach the brew chamber top to the glass carafe base. Place the silicon band onto the top of the carafe and fold over like so. Now screw the Duo stainless steel brew complete brew chamber onto the top of the glass carafe. Make sure it is aligned squarely so you get a straight alignment and the threads screw smoothly to ensure a snug seal. Let’s get your water heated first once the water is heated then you will grind your beans course like a french press or breadcrumbs. Once you have your grind done load your fresh Dangerous into the brew chamber. You will see your beans expand and release the carbon dioxide trapped in the bean from roasting. This is called a coffee blossom. It’s the Hallmark of a fresh roast!. let the blossom finish and then give a little stir using a spoon. Enjoy your strong tasty and smooth brew! Chemex is one of my favorite ways to brew Dangerous. A pour over in essence is coffee brewing in it’s rawest most primal form and Chemex captures that in one free flowing single apparatus. The design was inspired by the Bauhaus art movement and designed by Peter Schlumbohm in 1941. Critics of the day dubbed his designs a “a synthesis of logic and madness”. Crazy like a fox I say! Load your Chemex coffee filter and pour some water into it. The idea is to wet the filter so that you remove any linger chemicals in the paper. Then pour off the water. Honestly in my opinion with most premium filters you don’t have to do this because the chemicals have been removed but but if you want an extra step go ahead. If I don’t include this in my blog the coffee snobs will show up at my door with pitch forks. Place Chemex on your scale then measure and grind your Dangerous Coffee Beans medium to fine grind like sea salt. Load your fresh ground Dangerous and start your pour over. Starting in the center of the grind gently pour twice the amount of water that you have in grinds. You can eye ball it try to get all the grinds saturated using your water stream. The coffee will expand and bubble they call it a coffee bloom. I like to use the whisk here to agitate the grinds and get a super solid CO2 extraction. Allow about 30-45 seconds for the bloom to finish. The theory is that when you allow the CO2 to escape first then your grinds are primed for a swift and solid extraction. After the coffee bloom finishes it is time to finish your pour, Continue to saturate the beans starting in the center and working your way outwards in a circular pattern continuing to try to saturate the grinds evenly as possible. Watch the scale because you are going to stop once you have reached about 500 grams. Once you have reached the target stop and give it another whisk. Agitation during a pour over brew is also another form of classical pour over heresy but F it we live Dangerous I like the extraction it creates. Your done with the work now! Watch the pour over do it’s magic extraction of your delicious strong and super smooth coffee brew. It should only take a few minutes. The nice thing about a pour over is once you get the brew going there is no worry of over extraction you just set and forget. Once the drips stop pull the filter and toss it you are now ready to serve. The Pour -Over Method of coffee brewing is one of the oldest most simplistic methods of coffee brewing in the world. The industry experts consensus start of pour over coffee seems to originate in the story of Amalie Auguste Melitta Bentz. If you recognize the name you should because she founded the Melitta Coffee Company. It was a reaction to the bitter percolator coffee of the day. Percolator coffee is very prone to over extraction and so coffee of the day served using this method was often over bitter and acidic. She loved coffee and felt the flavor profile wasn’t reaching it’s potential so she came up with a more refined process. They say her first paper filter came from her sons ink blotting paper. She noticed the porous and super absorbent properties of the paper, took a brass pot punctured the bottom and constructed her first brew. Viola! The rest is as they say history! The first thing you will notice is the minimalist Bauhaus inspired design of the Kettle instead of curves it has angles but it’s lines have terrific flow. It comes in three finishes so far polished steel or copper and matte black. It features a counter balanced handle which when you pick the kettle up begs your make your pour. If your a fan of vacuum sealed hot and cold beverage containers than this may be the pour-over brewer for you! It’s the only double wall vacuum insulated brewer on the market. The brewing chamber enhances the brewing speed by keeping the brew temperature more stable and hotter for longer because it is insulated. The vertical walls and multi drip points give you rapid and even extraction insuring precision accuracy every time. The brewer is designed to flush with the carafe so it presents an elegant marriage of form and function.